National Spinal Cord Injury Statistical Center, Facts and Figures at a Glance. Birmingham, AL: University of Alabama at Birmingham, 2018. GUSU members can provide valuable insight into living with a spinal cord injury. 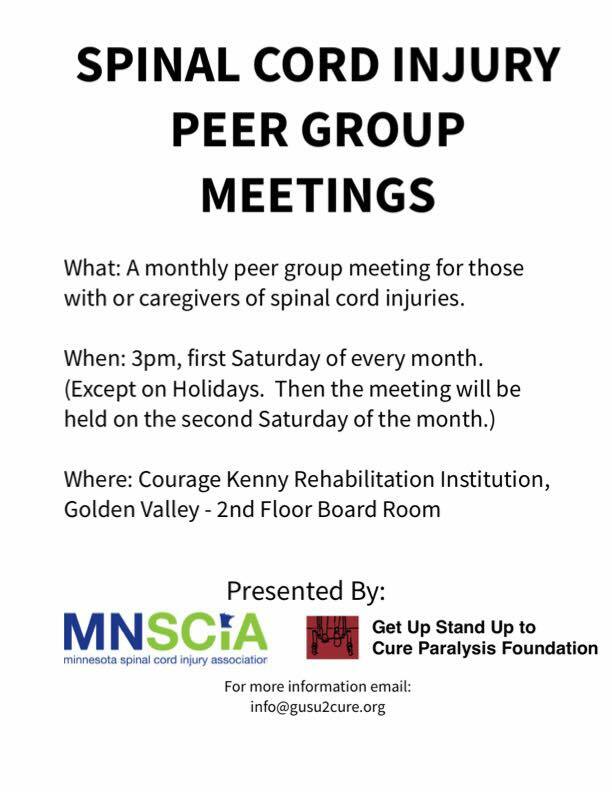 Peer group meetings occur the 1st Saturday of every month and one-on-one peer mentoring is available. Scientific advances are being made everyday. Here are some updates in the field. ​Asterias Biotherapeutics, Inc. announced 12-month data from the first efficacy cohort in the company’s ongoing Phase 1/2a SCiStar study designated to evaluate safety and efficacy of AST-OPC1 (oligodendrocyte progenitor population derived from human embryonic stem cells). 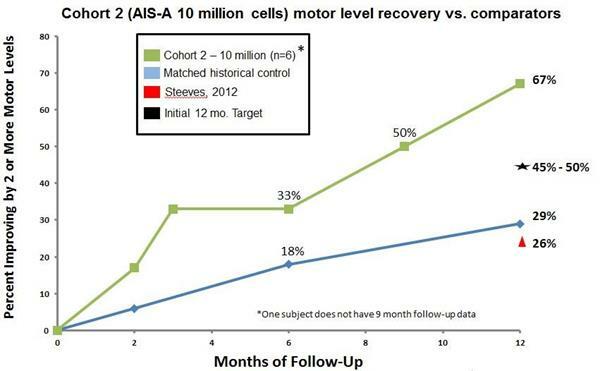 The 12-month data showed 67% (4/6) of Cohort 2 (AIS-A injuries administered 10 million AST-OPC1 cells) subjects have recovered 2 or more motor levels on at least one side through 12 months, which is more than double the rates of recovery seen in both matched historical controls and published data in a similar population. More information available here. Update on Dr. Kendall Lee and team's epidural stimulation trial at Mayo Clinic, Rochester. We post research updates on our Facebook page more often than we can update the website. Check out our page to see what research is happening lately and follow us! Another cell study is now enrolling cervical SCI patients for a clinical trial using oligodendrocyte progenitor cells. These are stem cells that have the potential to differentiate into neurons and astrocytes. This study is specifically for quadriplegics with complete cervical injuries and is following a phase 1 safety study in 5 people with complete thoracic injuries. ​The MN Office of Higher Education announced the recipients of the Minnesota TBI/SCI Research Grant Bill this afternoon. 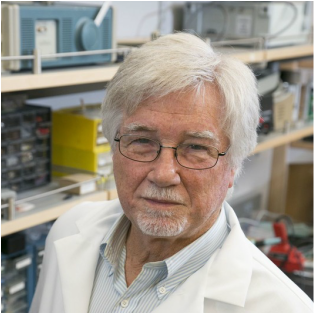 The projects for spinal cord injury research are studying Epidural Spinal Cord Stimulation for Spinal Cord Injury to improve mobility and function and Oligodendrocyte Progenitor Cells and Scar Ablation for the Treatment of Chronic Spinal Cord Injury. For a more in-depth look into these projects - click here. 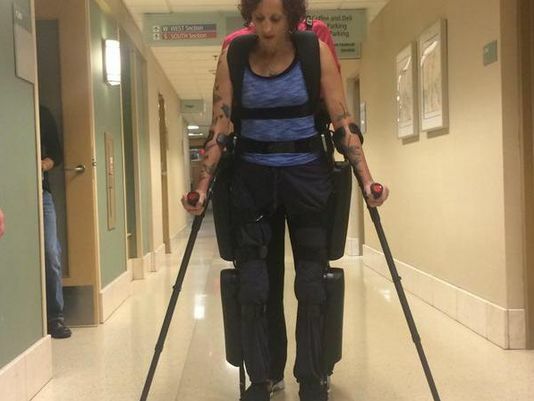 “The fact that they regained voluntary control so quickly..."
Great local Minnesota news story with Angie using the ReWalk Exoskeleton.